Azul Beach Resorts is a family of four high-end Caribbean destinations under the Karisma Hotels & Resorts umbrella. However, Azul Beach Resorts lacked a web identity of its own and instead lived within the Karisma website, among the nine other Karisma luxury hotel families. After completing a rebranding exercise, Starmark recommended a stand-alone website to differentiate the brand and elevate it above the other all-inclusives. The site also needed to further differentiate the Azul resorts from one another in order to better appeal to our target personas. Through compelling visuals and all new copy we highlighted the unique selling propositions of Azul Beach Resorts Riviera Maya, The Fives Playa del Carmen, Sensatori Mexico and Sensatori Jamaica. 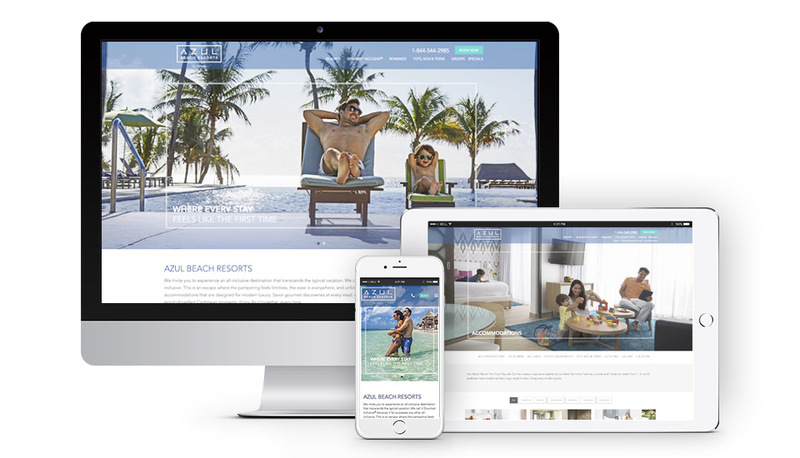 Creatively, the new Azul site also needed to align with the new ad campaign, which visually and verbally captures the perfect moments of a stay at Azul Beach Resorts.The mobile-first design incorporated short, informative copy along with large, swipe-ready images. To fine tune the users experience, Starmark implemented user testing throughout the process. At each stage of the design and development he site received repeated love for the lifestyle and getaway feeling — across mobile, table and desktop. Subjects also praised its “focus on family fun” that everyone can enjoy together and separately. Other program elements included search engine optimization (SEO), fine-tuning contextual links, a social Instagram feed, a prominent enewsletter form, image galleries and more. Now, www.azulbeachresorts.com tells the Azul story in a modern and engaging way, encouraging busy consumers to browse and plan all in one place.